PrizeRebel is another rewards program where you can earn points for completing surveys, offers, watching videos, etc. and redeem earned points for cash or other popular gift cards. I've been a member of PrizeRebel for a long time and this review is based on my personal experience. How to make money with Prizerebel. Prizerebel is a rewards program where you earn points. 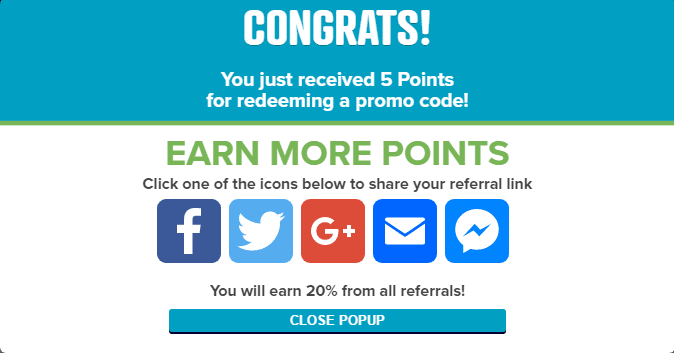 You can earn points for offers, surveys videos, micro-tasks, Raffles and more and redeem these points for various prizes like gift cards, cash, video games, online game cards, and much more. Seriously, much more. Prizerebel lets you set your goal. The default goal is $5 PayPal Cash. But you can set your goal for whatever you want. For example; your goal can be a $ Amazon gift card or anything that you want to redeem from PrizeRebel. Setting up your goal will keep you motivated and eventually increase your earning speed. Thus, you'll earn faster on PrizeRebel. Is PrizeRebel Legit or Scam? You can join PrizeRebel without any wories. The ways to make money available on PrizeRebel and Swagbucks are similar. But, Swagbucks is way bigger than PrizeRebel. From my experience, I can say that as compared to other similar companies PrizeRebel has higher paying offers. The only exception is Swagbucks. PrizeRebel has both paid and free offers. Mostly free offers require you to sign up for free trials of products or services or newsletters. As for paid offers, like the title suggests, completion of these offers involve spending money. PrizRebel has total 9 offer providers including, TrailPay, Adscend, RadiumOne and Dryverless. Read the instructions with extra care if you decide to do a paid offer. As some trial offers may require your credit card information. These trial offers must be cancelled before they expire or you'll be charged as per the offer. Surveys are a great way to increase your earnings on PrizeRebel. You can earn 50-200 points per survey you complete. PrizeRebel also pays you for watching videos. Every video wall has certain criteria for paying users. Like VideLoyalty will pay you 0.64 points for watching 3 videos and VideoLoyalty Premium will pay for every two video ads. You can see that watching videos on PrizeRebel is not very profitable. So, earn by watching videos while you do other things like getting ready for school/college/party, etc. Micro-tasks from CrowdFlower. While I was writing this (PrizeRebel) review I only got 2-3 tasks. The worst part was that I could only earn 0.1-3 points for one task. To complete tasks you'll need to create an account on CrowdFlower. Level: Many jobs are only available to contributors who have level badges. Pay/Task: The reward you get for each completed task in work mode, as set by the task author. Most tasks require you to submit a full page to receive the reward. #of Tasks: The estimated maximum number of tasks an individual contributor can currently do. This number will change based on a variety of factors including: number of other contributors working on the job, task author settings, and your overall performance. Rating: Average overall satisfaction as rated by contributors who worked on the job. Like Swagbucks and InboxDollars, PrizeRebel also occasionally publishes codes (series of random words and numbers) on their facebook page and twitter as a special bonus. You can enter these 'promo codes' on PrizeRebel and earn points. The codes can give you 4-7 points. A good way to earn for doing nothing, right? Note: Promo codes are live for a definite period (generally 24 hours) of time after that they expire. You know the meaning of 'win' right? You either win or lose what you paid for the entry. PrizeRebel has Raffles, Contests and Lucky Numbers to test your luck. I highly recommend you to don't even try these. I know, there is a chance that you could win, but what are the odds? you're your own boss (at home and of course, after your mother ☺). Refer your friends to PrizeRebel and get 20% of their earnings. You can refer as many users as you can. PrizeRebel has a wiide range of rewards. I don't know any other company that offers as many redeeming options as PrizeRebel does. You can redeem your points for gift cards (Amazon, Walmart), Cash (PayPal, Dwolla), video games, online game cards and many other prizes. You can also redeem your points for bitcoin. You can redeem for as little as 200 points ($2) once you are a silver level member. You'll become a silver member after earning 1,000 points. You start out as bronze. 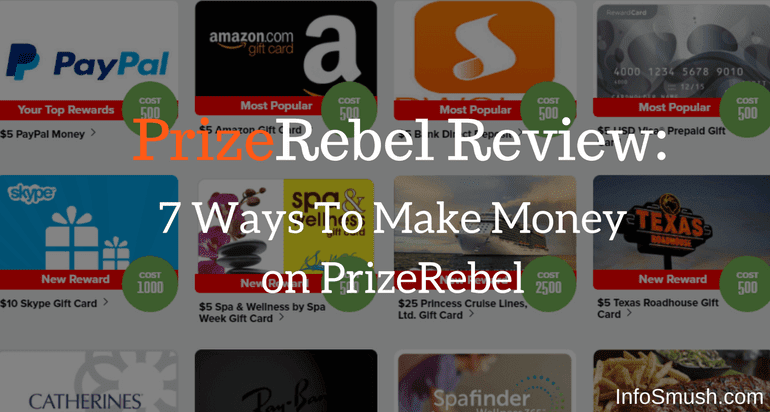 But if you would rather cash your points, Dwolla and PayPal cards start from $5 on PrizeRebel. What is PrizeRebel's Level System? On PrizeRebel you start out as a bronze member and level up as you earn points. 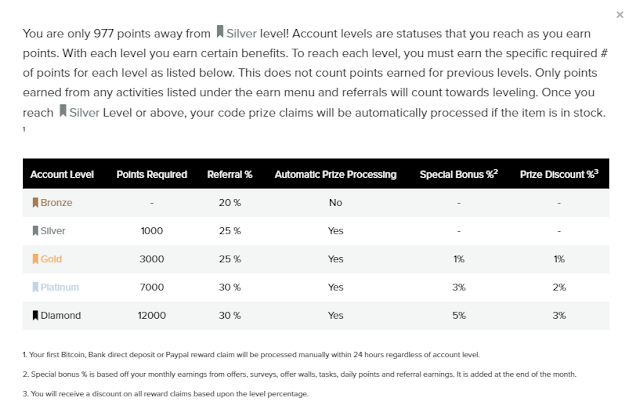 To become a silver member you need to earn 1,000 points and to level up to gold 3,000 points. The points you earned to level up to silver don't count for becoming a gold member. You'll need additional 3,000 points. Each level unlocks some special features for you. I have been a member of PrizeRebel for a long time and found it to be worth my time. You can register for PrizRebel here. PrizeRebel is a great program to make money with. PrizeRebel has over 6,427,981 (6.4 million, to simplify the numbers) members and since 2007 it has paid its members more than 9 million. It is one of the legit reward programms that actually pays you. From the same I have been able to get a good amount that I am needed for my pocket money. On the other side I have seen many people that are making good money by working properly. 10777Here are best materials for you!